What a Mother’s Day Gift! This was posted over on Hand to Hold’s official bloghttp://preemiebabies101.com for Mother’s Day and I just had to repost it over here! What an incredible gift! Thank you, Kelli! Mother’s Day will soon be here – a time to celebrate and honor mothers and motherhood – a time to reflect on the influence our mothers (or a significant maternal figure) had in our lives. And hopefully, a time where we, as moms are encouraged to relax and enjoy a little pampering. For moms with a baby in the Neonatal Intensive Care Unit (NICU), Mother’s Day can be bitter sweet. No woman plans or expects to begin her journey as a mom this way! But for more than 500,000 moms each year, their baby arrives too soon and too small, and must be whisked away to be cared for in a NICU. I wrestled with my role as a mom for many months following the preterm birth of my son at 24 weeks gestation. (Read my full story with before and after photos.) I felt more like a bystander than his mother because I was unable to hold him, feed him or participate in his complicated medical care. I was ashamed because I found the first photos of him to be terrifying and disconcerting. I was plagued with guilt for “failing” to carry him to term. I desperately just wanted to start over. I was not sure I could handle being the mom of such a medically fragile child. 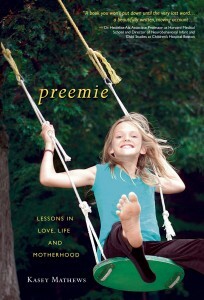 8 days until Preemie’s release date! Thanks to all for your ongoing support! http://kaseymathews.com/wp-content/uploads/2019/02/Kasey-mathewsNewLogo2019.jpg 0 0 Kasey Mathews http://kaseymathews.com/wp-content/uploads/2019/02/Kasey-mathewsNewLogo2019.jpg Kasey Mathews2012-05-21 11:41:262016-08-30 11:44:23What a Mother's Day Gift!